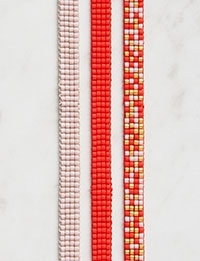 Our Woven Beaded Bracelets look like something you’re maybe not allowed to touch, like they might belong in a museum or in someone’s very special jewelry box. The great joy and surprise is that you are allowed, and better, you can even make them yourself! 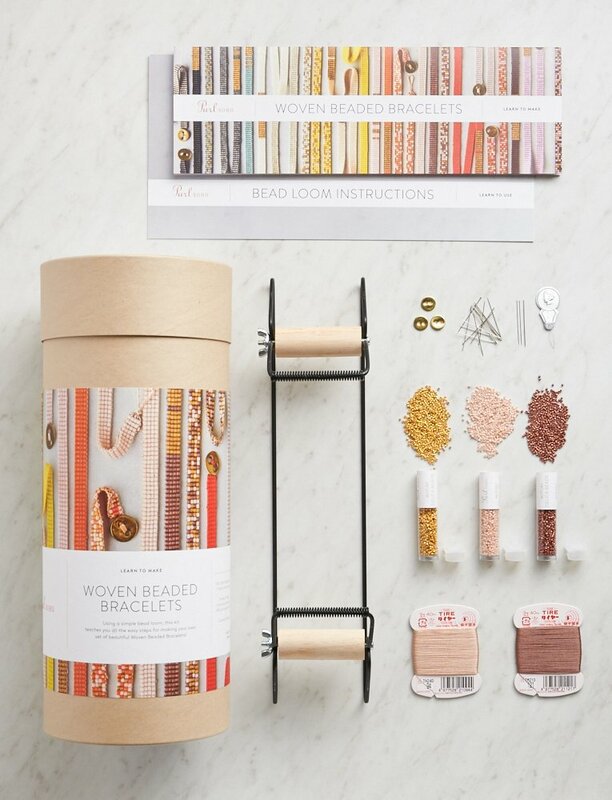 To get started pick up our Woven Beaded Bracelets Kit, a beautiful package full of all the little goodies you’ll need to make your very own set of three bracelets! 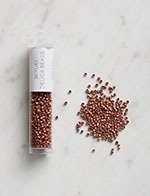 One critical goodie in the Kit is Purl Soho’s Bead Loom, a sneaker-sized tool capable of great things. 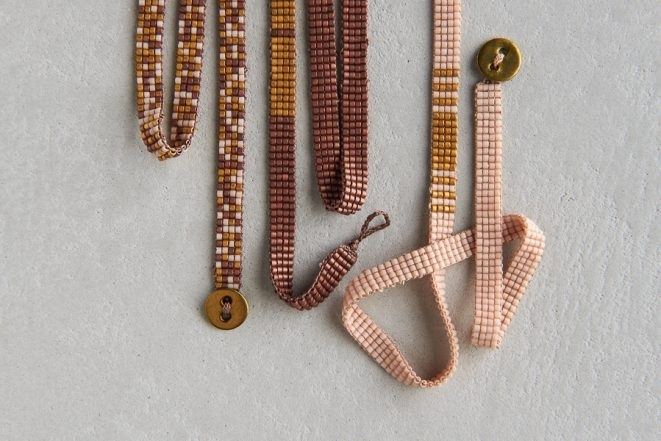 Using it is a super straightforward process, but what you can make with our Bead Loom is pretty amazing. It comes with very simple instructions and is also available separately. 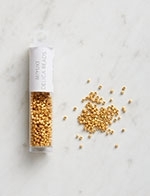 Also in the Kit are three tubes of Purl Soho’s Miyuki Delica Beads, including one tube of 24k gold plated beads. 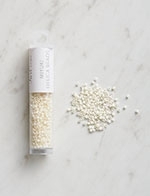 Miyuki Delica Beads are beautiful Japanese seed beads that are uniform in size and shape and flat on the ends, making them perfect for smooth and even weaving. 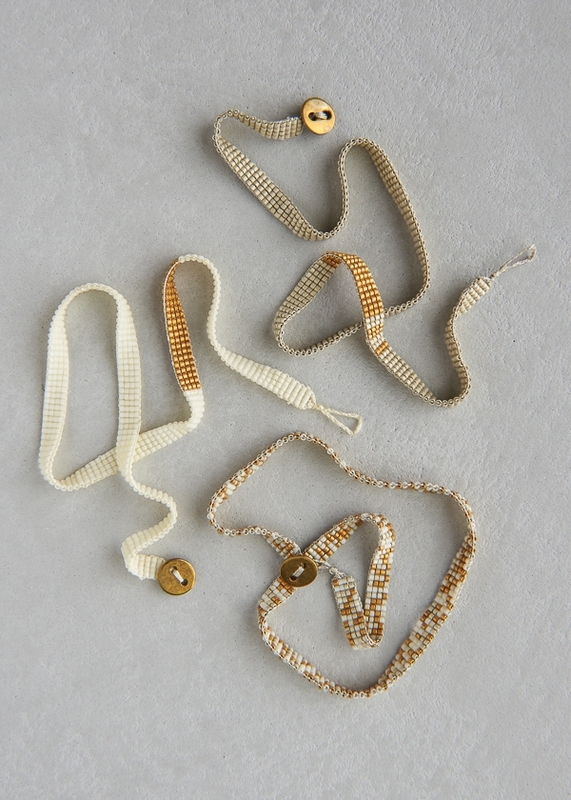 More goodies… You’ll also find two packages of Silk Hand Sewing Thread, three of Purl Soho’s Little Brass Buttons, a Woven Beaded Bracelets Pattern booklet (also available separately), plus a bunch of useful pins and needles! 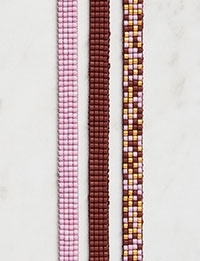 Altogether these are the materials you need to make three color coordinated bracelets: two nearly solid in color with a splash of gold and one that is all three colors randomly combined. 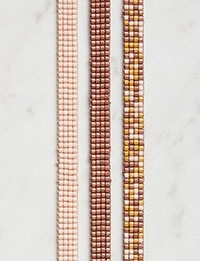 The Woven Beaded Bracelet Kit comes in nine striking palettes, including happy Honeysuckle + Yellow Yarrow (above) and subdued Pink Crepe + Rose Gold (below). 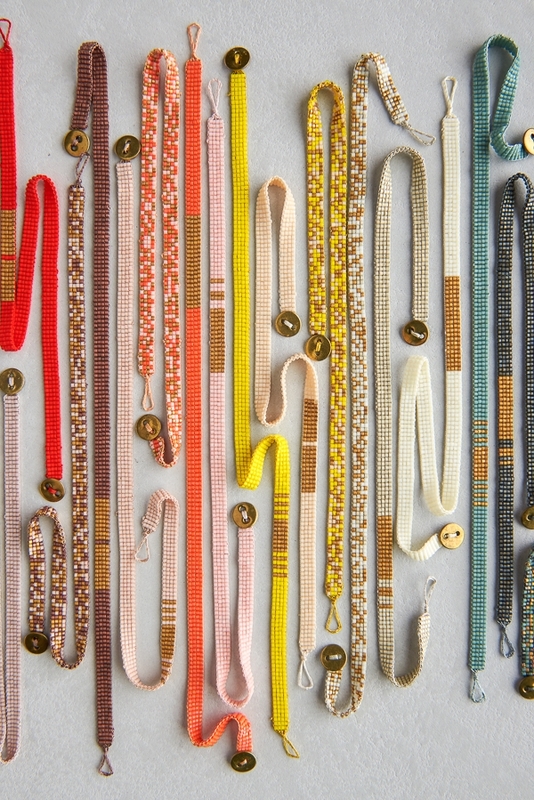 Each finished Bracelet wraps around your wrist twice and closes with a very pretty Little Brass Button. But best of all is the feeling you’ll get of being a master craftsperson when you’ve completed your own set of exquisite bracelets. They are truly special little beauties… to touch, to wear, to give, to be proud of! 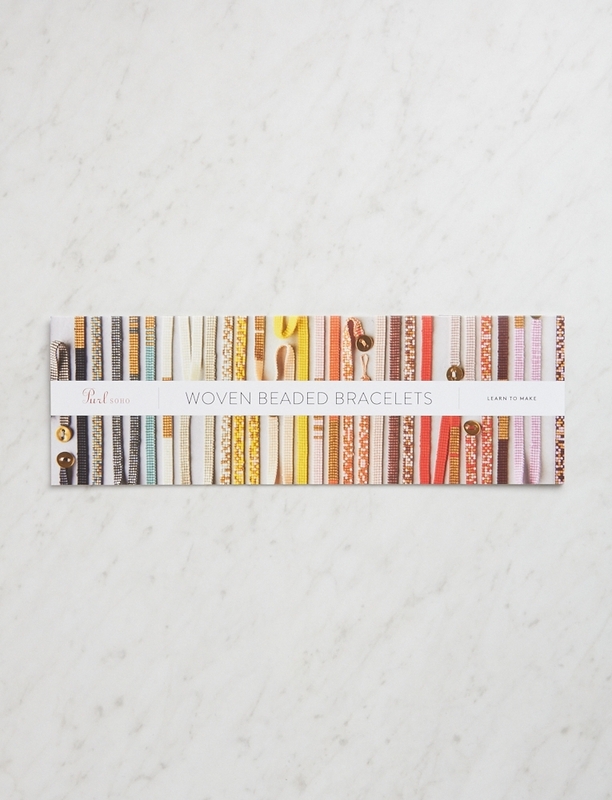 If you already have what you need, our Woven Beaded Bracelets Pattern is available on its own as a hard copy or PDF download. 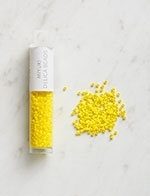 Have some beads and thread and want to experiment? 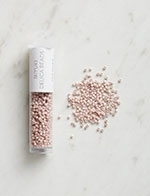 Our Bead Loom is also available on its own! It includes clear instructions with lots of helpful photos and tips! 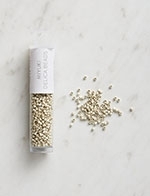 And finally, our Miyuki Delica Beads are also available separately. 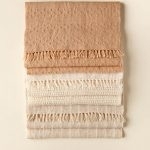 They come in lots of unusual colors, some rich and saturated, others soft and elusive. Enjoy them all! 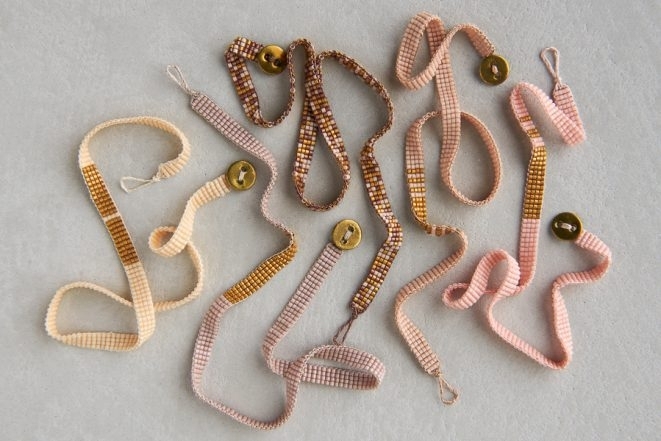 can I find the beads and thread option separately? Thanks for writing in! You can absolutely buy all of the items separately! Simply click on the item that you would like to purchase in the Materials section above and it will take you to the product page. There you will be able to see all of the options available and make your selections! These are lovely! 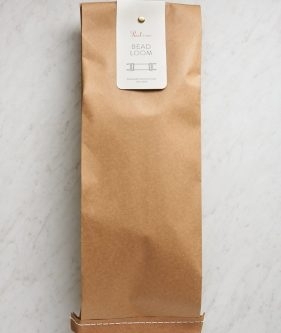 Is it possible to get the kit without the loom? I think it’s great that you include it but I recently bought one. Thanks for writing in! The kit is not available without the loom but you can buy each of the components on its own! 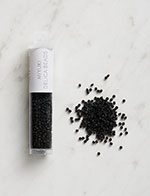 If you click on the links for each item under the Materials section above, you will be taken to the product page for each where you can purchase them! Hi! 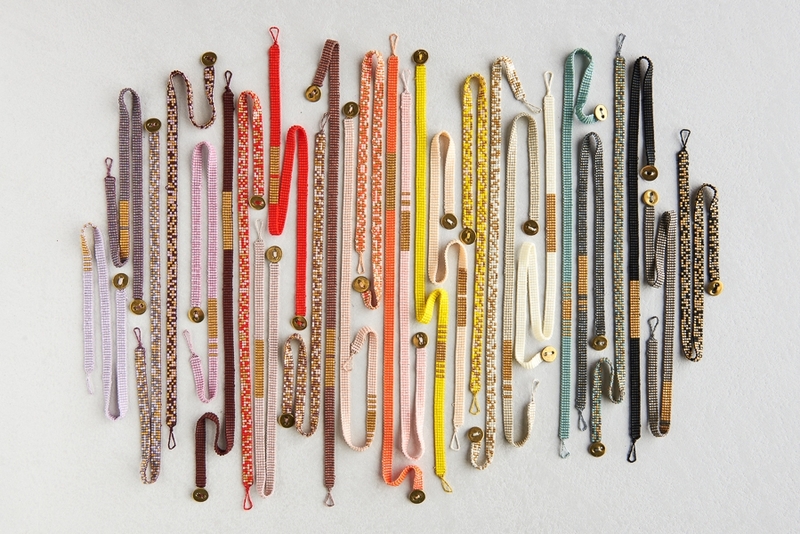 very excited about this project… I´d like to know how long it takes (in average) to do each bracelet? It seems a lot, but I had never done anything similar. Thanks for writing in! I think that including set-up and finishing, each bracelet will take a few hours, perhaps less once you get the hang of it! 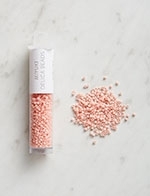 Is it possible to use this kit to make chokers as well as bracelets? Thanks for writing in! Absolutely! We had someone try one on in the store as a choker today. You may need to make it a little shorter or a little longer depending on your neck size but I think that they would be lovely! 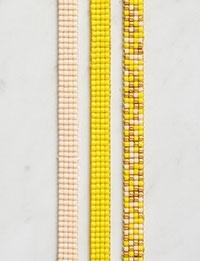 What is the length of finished bracelets? Or is there enough beads & thread to complete 16- 18 inch bracelet? Thank you. Thanks for writing in! 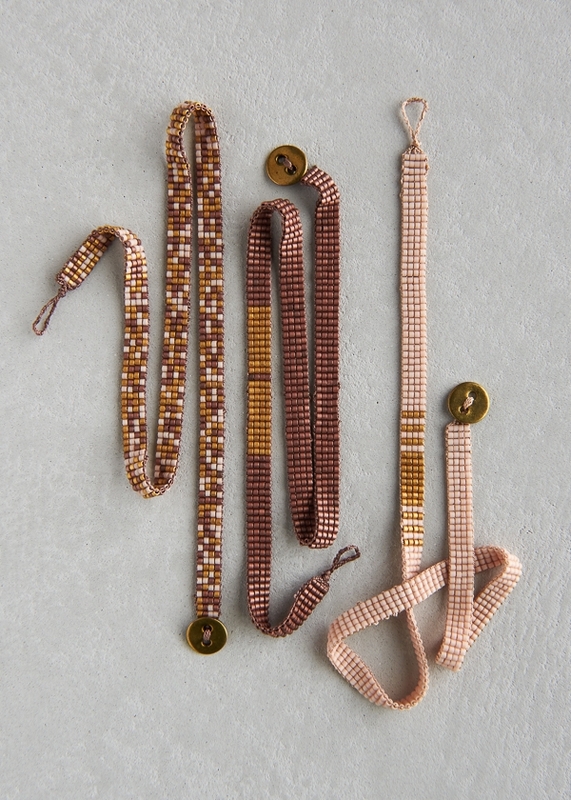 There should be enough beads and thread in the kit to make the bracelets 16-18 inches long! hi! what do you mean by “something you’re maybe not allowed to touch, like they might belong in a museum or in someone’s very special jewelry box”? Thanks for writing in! We mean that these bracelets look so special that you might expect to see them behind glass in a museum, like beautiful artifacts, or stashed in a place where someone keeps the items more important to them. 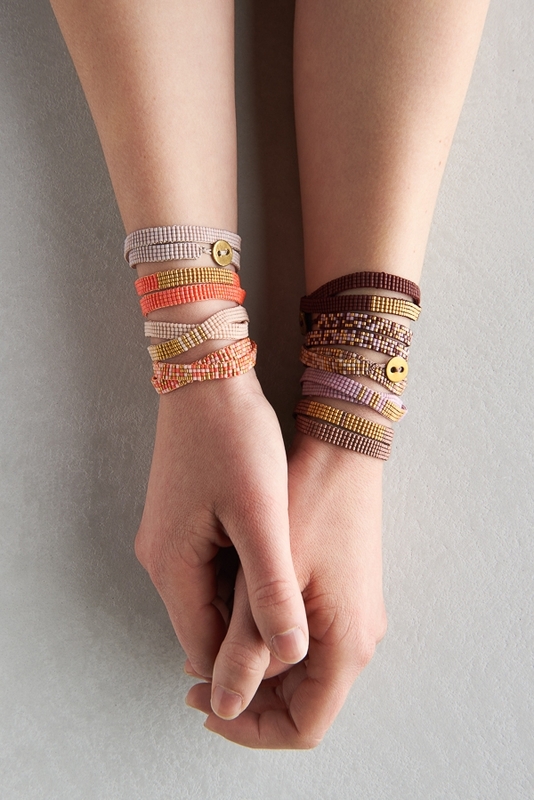 What we were trying to convey is that we think that these bracelets have an elegant artistry that seems unattainable, but, in fact, they are totally do-able by most crafters! We love that! The loom looks exactly like the one made by Darice. Is it different somehow? Thanks for writing in! 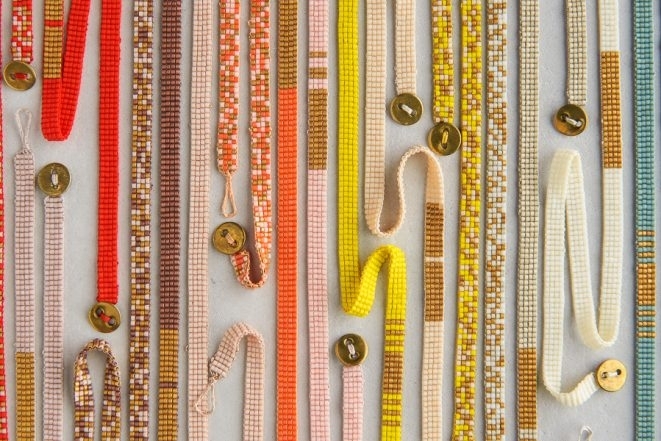 The bead loom is a basic bead loom that several companies manufacture. 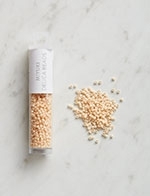 Ours is not different save for that it comes with our own instructional booklet and packaging. What age group could make these bracelets? They are adorable! Thanks for writing in! While every child is different, we have seen crafty kids of 9 or 10 and up using this lovely loom. I, myself, starting using a similar loom at around 10! Hey, unfortunately I missed out on the rose gold combo set, any chance you will have it back in stock soon? I am desperate to get my hands on it…:) Thank you! Thanks for writing in! We will be getting these back in stock but are not certain of the date. I would suggest signing up to be notified when the items are back in stock. On the product page, select the color and where you would normally put the item into your cart, you can sign up to be notified via email when we have them back! Thanks for writing in! We are sorry to hear that you are having difficulties. It sounds as though your tension might be a little off. I would suggest making sure that the warp threads are wound tightly and that there is no slack in the working section of the warp threads. You should then try to pull a littler tighter or looser depending on how you have been working when passing the needle back through the beads. I also find it helpful to weave a little piece of paper through the warp threads, next to the coils before I begin working with the beads to give me something to work against. I remember using those when i was younger. 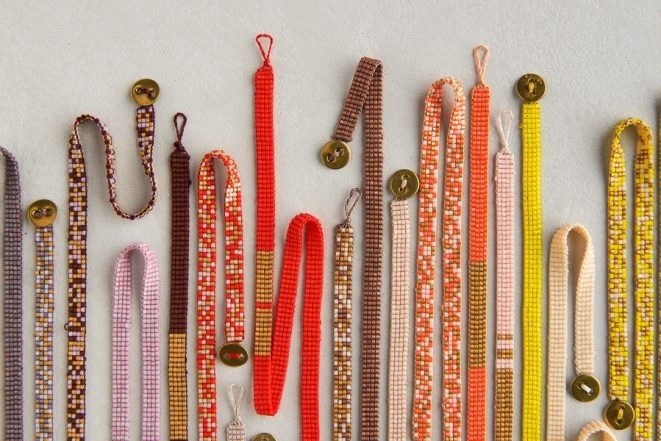 How do you make the bracelet longer than the loom? Thanks for writing in! 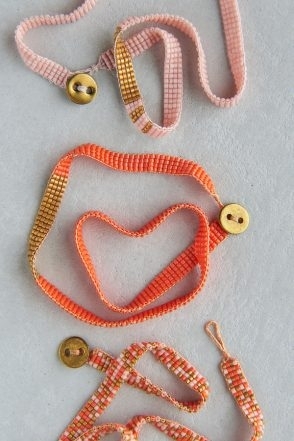 These looms are a lot of fun and easy to use! 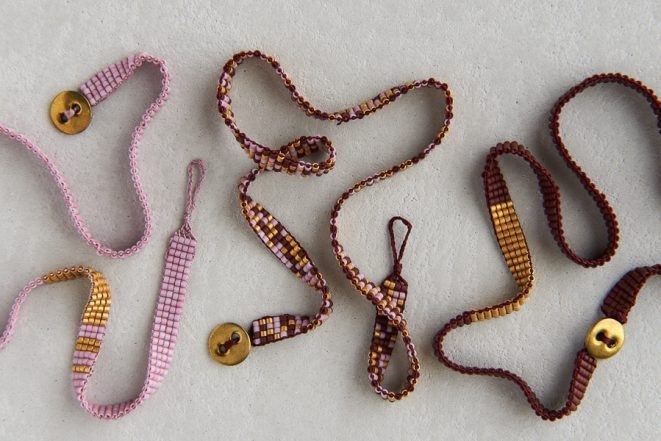 To make a bracelet longer than the loom, you will cut longer wrap threads and wrap them around the roller. As you work to the end of the loom space, you will just wind the finished portions onto the opposite roller to where the warp threads are wound and continue to work! Does the pattern book come with instructions of how to finish off the loop-end and the button-end of the bracelet? I didn’t want to purchase the book if it was just the patterns. Thank you. (I already have the loom). Thanks for writing in! The pattern booklet does include directions on how to finish the button and the loop end! I love this kit and have already made a couple of lovely bracelets. My comment is more of hint that others may find helpful. Since I was working from my own pattern, I found the length a little hard to judge, especially if I wanted a symmetrical design. 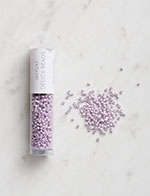 Hint: 16 beads equal 1 inch in length. Thanks for writing in and for your kind words! You have it spot on! An overhand knot is just about the most simple knot. It does look quite a bit like the knot is tied through the threads but it is an optical illusion. The overhand knot is tied as close as possible and then the thread is woven in as described. You can certainly do a second overhand knit before doing this to give yourself a little more insurance but the lovely silk thread should hold just fine! 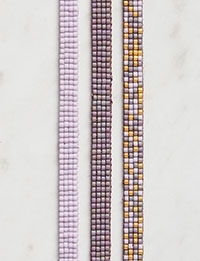 Hi, I’m half way through weaving my first bracelet and realized one of the beads came off – I must have not gotten my needle back through all the beads. How would you fix this mistake without having to re do all the weaving I’ve done? Thanks!! You may be able to weave it back on using a new thread by going through the other beads + the lost bead on the same row and then weaving it through the next few rows to secure the thread. I love this kit! 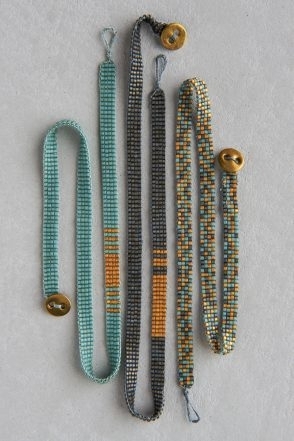 This is the first time I have worked with weaving beads and find it fascinating. 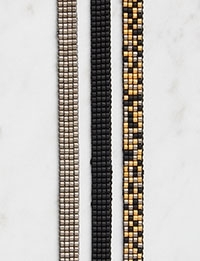 I an in the process of weaving my first, the “random pattern” bracelet, and have a couple questions about the process. Am I the only one who has had issues with trying to get the needle threaded? I have gone through at least 3 needle threaders as the small eye needle is not easy to work with, so end up with shredded thread. And my second question is similar, as my working thread seems to shred easily before I complete the length of thread. Any assistance is greatly appreciated! Thank you for another fun kit. Thank you so much for your kind words! I think the best way to handle splitting thread is to run the end of the thread through a bit of wax to make the ends stick together. An old candle stick should do the trick! I love this project! 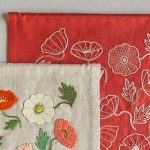 I would like to make napkin ring holders and wondering if these can be made wider and shorter than a bracelet. Thanks! You absolutely can make your project wider and shorter! When making your warp you can just add a few extra ends to make it the right width. 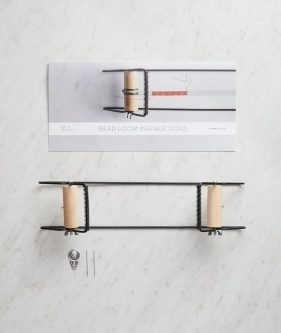 Hi Cassy I already have this loom but love the bracelets, can I purchase the pattern book on its own and will it have the instructions as well on how to make them. I’m really enjoying making these as Christmas presents. I feel like I’m missing something with the finishing though – the instructions say to weave each of the 5 warp threads in through the beads to finish, but I can’t for the life of me get them all through. Am I misinterpreting the instructions? Any help would be great! Thanks for reaching out! 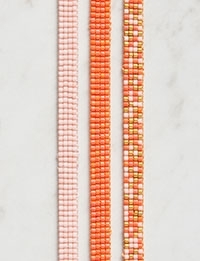 Getting all 5 strands through one row of beads can be a challenge. I would suggest trying to get a few strands through the first row and a few through the second. Then take those that went through the first row and bring them back through the third and the second through the fourth. This should make things a bit easier! This was a learning experience for me. 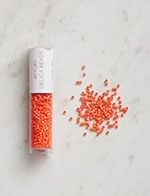 I enjoyed using the beading loom but found the tiny seed beads a challenge. The finished bracelet is lovely and very dainty at only 1/4 inch wide. My next bracelet will use a few more warp threads for a wider bracelet. 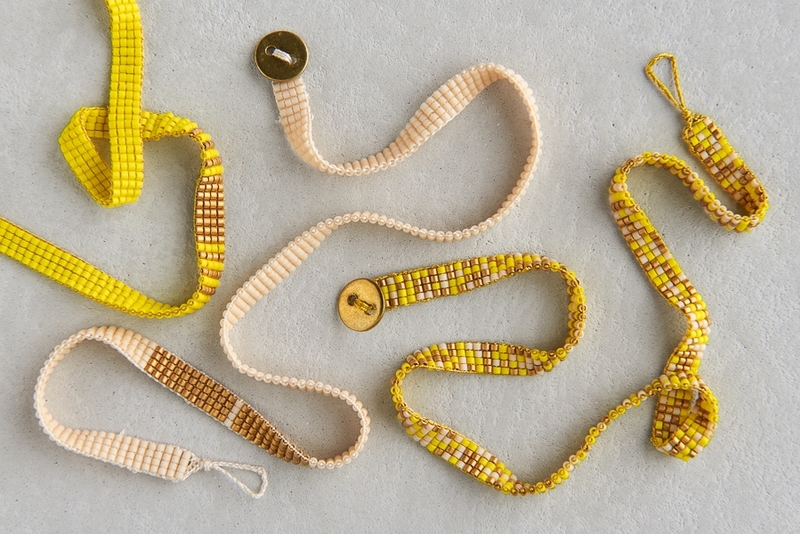 As a tip for newbies, make sure you leave enough extra thread before you begin weaving to finish the bracelet. 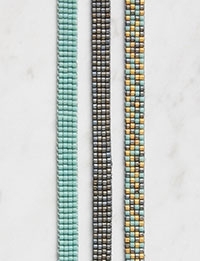 Can you please tell me the length of the of the beaded section of the bracelet compared to the finished length including loop and button attachment? For example, when the instructions samples a 13″ bracelet does that included the end of the bent loop to the center of the holes in the button? 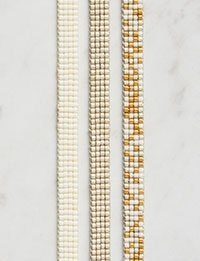 Am I correct in thinking a 13″ beaded section will finish as a 13 3/4″ bracelet? Thank you for this great question! The beaded portion of this bracelet is 12 1/2″ and the entire bracelet is 13″. I organized my neighbors to have a Beading Soiree when I saw this kit. 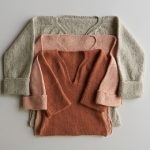 If you saw a lot of kits being sold in Tappan NY, that was why. Well, the soiree was Weds night. We had a lovely time. 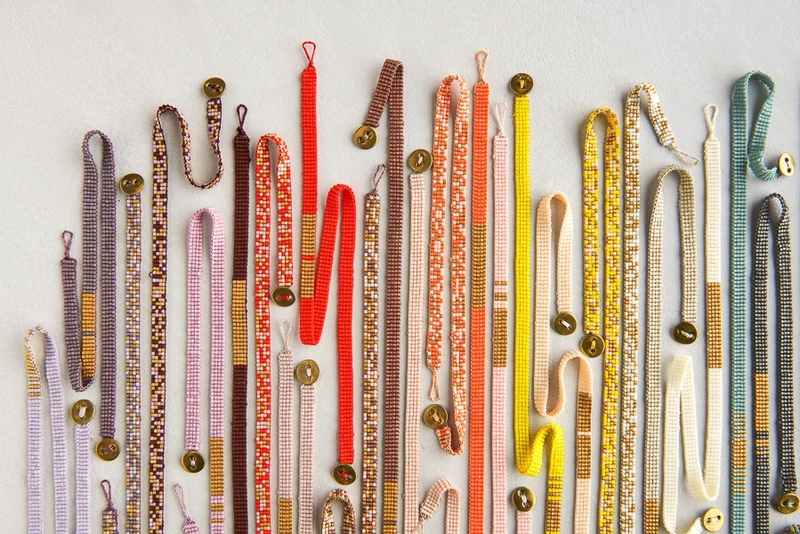 Several very pretty bracelets are well on their way to completion. I read the instructions carefully and successfully loaded the warp on my loom the night before the soiree so that I could help the others. 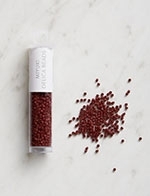 This also informed me that reading glasses, measuring tapes, a white table cloth and small white dishes to contain the beads are some essential tools to our success. I have a couple photos of the evening I’d love to share with you but I don’t see anyway to submit them here. Thanks for the kit. It enabled our neighbors to connect, make memories, share a few laughs and support each other in their beading challenges. It was really fun. That sounds like a wonderful evening and we would love to see your photos! 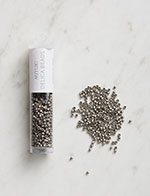 Please feel free to send any that you have to customerservice@purlsoho.com, and I hope this is the first of many evenings full of crafting and companionship!